Is the Best Rated Mattress REALLY the Best One for You? 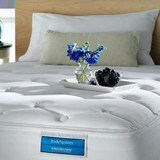 Welcome to Best Mattress Reviews! We are an independent consumer site dedicated to helping you to get a better night's sleep by sharing little known information that can not only benefit your health, but save you hundreds or even thousands of dollars on your next mattress purchase. Why most mattresses are overpriced, and how to save money on your mattress. Why a mattress that may be considered the best rated mattress makes you feel worse when you sleep on it! 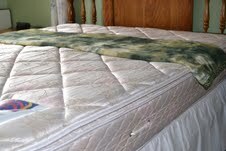 Why conventional innerspring mattresses may not the best choice if you have chronic health problems. How the right mattress can help to reduce or eliminate your back pain, aches and pains, and even some allergies and breathing problems. We do not sell mattresses. Instead, we research mattress ratings and reviews from our own consumer perspective. Yes, it is my aching back that is the ultimate test! A great night's sleep is essential in today's stressful world. A comfortable mattress can literally change your life, and we'd like to help. There are some new and healthier sleep options that are becoming more available now, and for some people they can make the difference between getting a great night's sleep or not sleeping at all! Discover why more people are choosing organic mattresses, latex mattresses, cotton or even wool mattresses for their most comfortable sleep. Learn more about natural and organic bedding, hypoallergenic mattresses, the best mattresses for those with chemical sensitivities, allergies, and the best mattresses for back problems. We research and review all the major mattress brands such as Sealy, Serta, Simmons, Sleepys, Tempurpedic, King Koil and more, with an eye towards those that will provide you with the healthiest sleep possible. Learn about the many different styles of mattresses, from those which fit baby cribs to those which are more suited for super king size luxury beds. Single, double, camping and bunk bed mattresses and air mattresses are all independently reviewed. We also include handy mattress size charts for different countries, information on the latest consumer reports best rated mattress, and useful hints on sleeping well, and on the maintenance and care of your mattress and bedding. Our Best Mattress Reviews website is compiled by independent consumers from all corners of the globe and edited by yours truly! :-) I am a long time traveler who has slept on almost every kind of sleep surface imagineable. I grew up on a bunk bed, and as an adult have slept on conventional innerspring mattresses, futons, air mattresses, camping mats (ouch!) and even hammocks. You would be surprised how comfortable the right kind of hammock can be! In my later years I became more sensitive to chemicals and also injured my back, and I found that most conventional mattresses caused breathing problems that made it impossible to sleep! I am now a devoted fan of organic and latex mattresses, and am enthusiastically learning all that I know about the many new natural sleep options that are available now. I'd like to hear your experience with sleep and mattresses of all kinds! I invite you to share your knowledge and your best mattress reviews by adding a review of your own best rated mattress, style and brand.